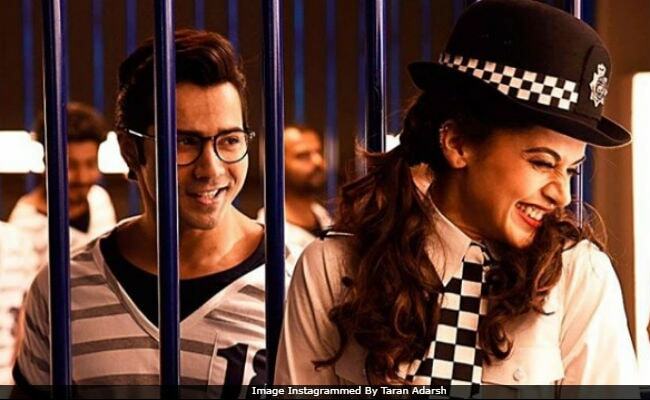 Varun Dhawan's Judwaa 2 is inching towards the 100-crore mark at the box office. The film, which released last Friday, has so far made Rs 98.08 crore, reports trade analyst Taran Adarsh. Judwaa 2 is a remake of Salman Khan's blockbuster film Judwaa (1997) and stars Taapsee Pannu and Jacqueline Fernandez opposite Varun. On the opening day, Judwaa 2, earned Rs 16.10 crore and in the first weekend, the collections went over Rs 43 crore. Taran Adarsh reports that the second week would be 'crucial' for the film. "Week 2 will decide if it can emerge the HIGHEST GROSSER of 2017, after #Baahubali2... Hindi films...," he tweeted. Here's Judwaa 2 box office score. #Judwaa2 Fri 16.10 cr, Sat 20.55 cr, Sun 22.60 cr, Mon 18 cr, Tue 8.05 cr, Wed 6.72 cr, Thu 6.06 cr. Total: 98.08 cr. India biz. SUPERHIT. In his review for NDTV, film critic Raja Sen gave Judwaa 2 1.5 stars. "I like young Dhawan. I enjoy his work in movies as disparate as Badlapur and Badrinath Ki Dulhania, but in Judwaa 2 he isn't allowed to do his own thing. Instead, he's trying to match a marvellously inane Salman Khan performance. Varun Dhawan curbs his natural spontaneity to try and ape Salman Khan," he wrote. This year, Akshay Kumar's Toilet: Ek Prem Katha is the only Hindi film to have made over Rs 100 crore at the box office. This Friday's major release is Saif Ali Khan's Chef while TV actor Barun Sobti's Tu Hai Mera Sunday also hit the screens today. Will Varun's Judwaa 2 box office score be hit by these films? The answer lies on Saturday's collections. Judwaa 2 is Varun Dhawan's second release of the year after Badrinath Ki Dulhania which was also a hit at the box office.